First of all, let’s get this straight — fee-happy carrier Spirit Airlines isn’t going to be charging every passenger $100 for a carry-on bag, although that would honestly not surprise us. But if you’re a passenger meeting certain conditions, you could end up paying a maximum of $100 just to bring that roller bag aboard if you’re not careful how you go about it. It’s already one of the very few airlines that charges passengers to bring bags on during the flight, and yesterday the airline announced a range of fee hikes for that privilege, reports the Dallas Morning News’ Aviation Blog. All changes will be instituted starting Nov. 6, so make sure you read up on the new rules before you get to the airport or you’ll be stuck with some heavy fee damage. 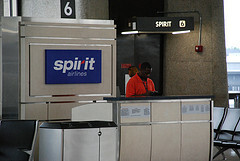 Spirit says it’s already saved a nice chunk of change on fuel costs because of the fees and it makes the boarding process easier for everyone on the flight. Basically anyone who brings a carry-on is facing a fee hike — but if you’re part of the “$9 Fare Club” and pay when you book the ticket, your price only goes up from $20 to $25. Regular customers who pay the fee beforehand (at least before check-in) will pay $35 instead of $30. Most fees are only going up by $5 or $10, but if you realize or decide you need to bring a carry-on bag at the boarding gate and somehow have escaped paying the fee for it, you’ll pay $100 instead of $45. So start thinking way, way ahead. Check out the complete fee list on Spirit’s website.